John Oliver has been around for years. Here is a small bit of information about him. 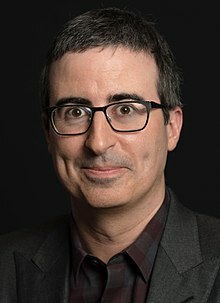 With John Oliver anything is fair game. You can find segments from his show Last Week Tonight on Youtube. He ripped a new one on those Word Of Faith televangelists for example. Why are you out? Buy a park and operate it as you outlined. Report back. Then cast stones. Because it’s easier to create rules for other people to follow? Actually, no. As long as there is an unscrupulous mob taking advantage of the tennants to earn outsized returns, the price of parks will artificially exceed their proper value. Only through implementation of legal requirements or industry self regulation will the prices for parks return to a level that will allow the implementation of tennant-friendly policies, that result in morally defensible financial returns. As long as owners are allowed to screw their tennants and reap the outsized returns, the prices of the parks will remain too high to let the owners who want to behave ethically, do so, and still return a fair profit. That said, creating a new park with these kinds of rules is something I am actually considering. Even there, the exit strategy will take some thought; I would hate to sell to an abusive new owner who will go in and destroy my community who trusted me with their home placement. Maybe set it up so that it can be sold to the tennants at some point? Following that line of thought, I have not done the numbers yet, but there might be some serious money to be made in financing the purchase of parks by the tennants, and thereby converting them to co-ops. At the end of the day, I love the idea of helping folks obtain reasonably priced homes. Way back in the day, I developed (attempted, rather…did not ultimately work out) a mobile home residential development. I subdivided a section of land into lots large enough for a mobile home and small yard. It was big enough so that each lot could have a septic, as we were located in the country. I got the parcel transferred to the adjoining school district, which was more attractive, and I was able to develop and get approved by FHA, a tie-down system, so that these homes would qualify for FHA loans. To complete this short tale, I ran out of money before I ran out of problems, and one of the contractors I spoke with about some of the work I would need done, began selling similar lots on his property just down the road…that tore it and I stopped trying. Tom- honestly it just sounds like you’re full of judgement and excuses. I have no interest in arguing your post. I do believe you can have financial returns and be ethical. I go to bed very well knowing that I am providing safe, clean, affordable housing and making a return offering a good product. Get off your high horse Tom. Put the excuses down and walk the talk. No MHP experience, never seen a turnaround park (and the investment required to make it nice), no idea that rent control limits development of new affordable housing, taking broad strokes to label everyone a bad actor for the actions of few. All bad no good blah blah blah. You, sir, are what we call - a troll. Interesting comments from tbergman sometimes differing viewpoints are needed just to see others perspective without being judge mental. I personal learn from my critic’s and life is a learning experience and with over 40 years in the business; still learning plus this forum is very helpful. So we should all be taking advice from someone who actually failed at the business? No thank you.